Someone years ago shared this poem with me, and it has really stuck with me through the years. The author is unknown. I have heard that it has been attributed to Eleanor Roosevelt, but who knows? 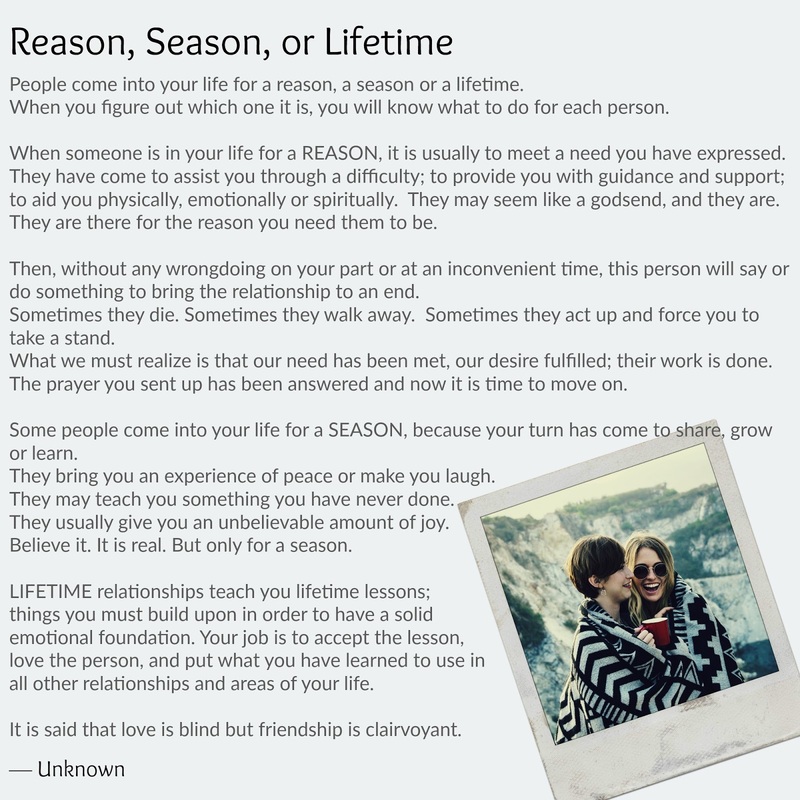 The poem says that there are people that come into your life for a reason, a season, or a lifetime. The season relationship. Wow, these are the toughest, I think. Sometimes you confuse the season with the lifetime. The season relationship may be one of the happiest of your life, yet it has a shelf life. Maybe it's your college roommate who you went through thick and thin with, but slowly grew apart over the years as your lives took different paths. Maybe it's your first "real" boyfriend who taught you what you did (or didn't want) in a relationship. Maybe it's a mentor like my college professor who introduced me to my grad program, which introduced me to a wonderful career that I didn't even know existed, which led me to meeting my husband. Sometime it is a job or career that you have outgrown or a group that you belong to that you have outgrown or no longer identify with. Don't resist, fight, or deny the lesson the season relationship is trying to teach you, otherwise the season lasts too long if you catch my drift. Don't waste your time being bitter or hanging in there. Acknowledge the lesson, learn from it, adapt and move on. Then there are lifetime relationships. They are rare, they are beautiful, and they grow with you. My lifetime friends have kids, and don't have kids, are married and not married. We are totally different, yet weirdly the same. Those friendships sometimes defy explanation, yet that doesn't matter because they don't need explaining. Those relationships teach you lessons that help you navigate all the other relationships. They come with unconditional acceptance of who you are as a person. Not a mother, not wife, not your common career, or what walk of life you are in, but you. No matter how much time passes, when you speak again, time just falls away. Sometimes lifetime relationships are not easy, welcome, nor do they bring you joy. Sometimes they are necessary for the greater good, like a relationship you maintain with an ex or your mother-in-law for the sake of the kids. There is a lesson there as well to learn (and keep learning), be it patience, empathy, setting boundaries, swallowing your pride or standing up for yourself yet maintaining the relationship. Those are lessons that serve you well in all your other relationships. Here's the thing to remember.... You need them all. They all serve a purpose. The key is figuring out which one it is, learning all you can from it (whether you are the teacher or the student), AND knowing when you have outgrown the relationship. It's great to hang in there and try to make things work, but it is equally important if not more important to know when to walk away from something that is no longer serving you or helping you grow. No doubt about it, sometimes growing hurts. Hey, it's not called growing pains for nothing. 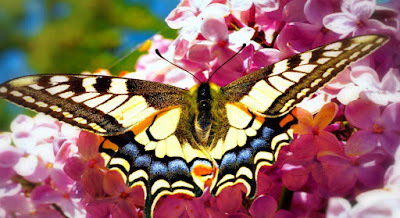 Have you ever seen a butterfly emerge from it's cocoon? That doesn't look too comfortable. It looks hard and painful, and it takes FOREVER, but looks what comes out. Do you know if you help the butterfly speed up the process, you actually make it weaker? It's that struggle that gives it the strength to survive what's ahead. Live the lesson, extract what you need, adapt, and move on when necessary. That's not simply growing, that's transforming, and true transformation can't be undone. So no matter what you are going through right now, know that you are growing your beautiful wings, and real soon you are going to unfurl them and fly.